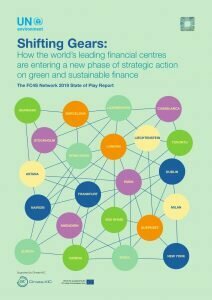 This report, published by the Financial Centres for Sustainability (FC4S) Network, measures for the first time the contribution of financial centres to sustainable development and the ongoing low-carbon transition. It also identifies key challenges facing this growing sector. ​In 2018, supported by EU EIT Climate-KIC the FC4S Network established an Assessment Programme to track the progress of financial centre efforts to support the expansion of green and sustainable finance markets, and explore different ways of measuring the contribution of financial centres to sustainable development and the low-carbon transition. New forms of public private partnership: Nearly two-thirds of financial centre initiatives on green and sustainable finance are partnerships between the private and public sectors, giving them unique ability to link policy and practice. There are material barriers to growth: The top three barriers faced by financial centres are i) a lack of green financial products, ii) inconsistent standards and iii) insufficient market demand. Lack of a shared language for green and sustainable finance is a key constraint, highlighting the need for continued dialogue between public and private stakeholders on taxonomies. Policy innovation is a key driver: New policy initiatives and action by financial regulators and supervisors is a key driver in half the financial centres, with system-wide initiatives and debt capital markets the most cited examples. In a quarter of centres, policy and regulation is touching upon equity and debt capital markets, insurance, investment, banking and system-wide action. New instruments are proliferating: Over 75% of financial centres noted the presence of different debt instruments related to green and/or sustainable finance – primarily green bonds. Equity instruments are on the rise, with 25 % of respondents noting the presence of structured products, closed ended funds, and discretionary mandates. Progress varies across sectors: Investment and asset management is the most mature sector with respect to green and sustainable finance in most centres, while green banking is evolving, and insurance has the furthest to go. Professional services are growing rapidly: Over 75% of respondents acknowledged the presence of sustainable rating services and consulting firms; other services (sustainability research, labelling, legal, clean techs and carbon trading) are present in select financial centres. Shared priorities for Future Action: Leading financial centres have identified further product development, improved data collection and better market standards as top priorities for further development. Focus on Innovation: Applying financial technology (fintech) solutions to sustainable finance challenges is a major focus for financial centres, with several FC4S members establishing specific projects aimed at fostering innovation – including accelerator programmes. Increasing international collaboration: FC4S member centres are working more closely together on sustainable finance, including through bilateral projects. More and more centres are seeking to join the FC4S Network to benefit from collaboration opportunities.